The U.S. is known as the “melting pot” of people and immigrants from around the world that fuse and mix together. The term became popularized from the 1908 play of the same name, The Melting Pot by Israel Zangwill. The United States Census Bureau publishes various data and statistics of foreign-born persons residing in the U.S., which can be reviewed here. Some highlights from the The Foreign-Born Population in the United States: 2010 are as follows (with nearly 40 million foreign born persons). What number of foreign resident family members might these 40 million persons have? What type of assets and businesses remain in the country of origin for these foreign-born persons? The regions of greatest foreign-born populations is Latin America (21 Million), Asia (11 Million) and Europe only 4.8 Million. Foreign born families regularly (if not most commonly) keep important ties with their home country. Some have the majority of their family members living in that country, assets and businesses from the country of origin or neighboring countries in the same economic region, and many may ultimately have a plan to move back to their country of origin. More related information and details to come in future posts. 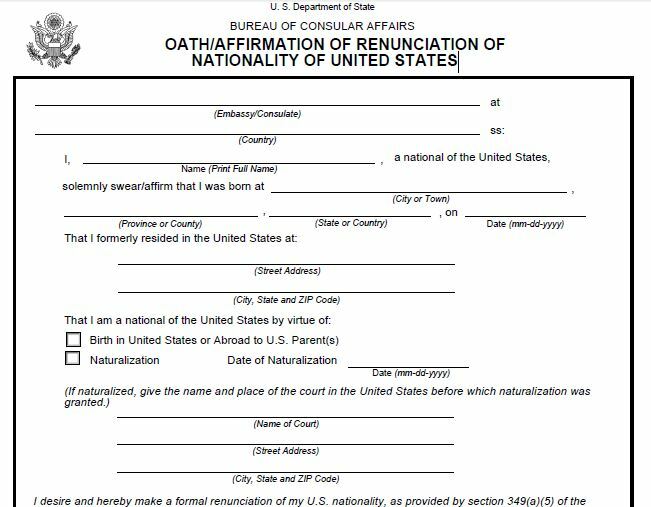 Form DS-4080, Oath of Renunciation of the Nationality of the United States. Form DS-4081, Statement of Understanding Concerning the Consequences and Ramifications of Relinquishment or Renunciation of U.S. Citizenship. You will not pay, nor receive a receipt if you process your “relinquishment” as opposed to renunciation. The date of the appearance and oath taken (which is important for timing purposes as explained in the prior post regarding Section 7701(a)(50)). How the U.S. imposes income taxes on Social Security retirement benefits on former USCs and LPRs who reside outside the U.S. Previous posts have explained how the Social Security Law and the U.S. federal tax law are different bodies of laws that have different rules for U.S. citizens who renounce and LPRs who formally abandon their permanent residency status. See, Why vested Social Security Retirement Benefits are not lost when a USC or LPR sheds their citizenship or immigration status. The Answer to: What happens to social security benefits to former USCs and LPRS including a “covered expatriate”? This post explains the unique U.S. federal income tax treatment of social security retirement benefits. The tax treatment is different for USCs and former USCs who reside outside the United States. Former USCs who reside outside the U.S. become “nonresident aliens” and hence are subject to a withholding tax that reduces the net Social Security benefits. The U.S. federal government withholds the tax immediately on all Social Security retirement payments to nonresident aliens at a 25.5% rate (calculated under the statute as 85% of the normal 30% statutory rate). See, IRC Section 871(a)(3). 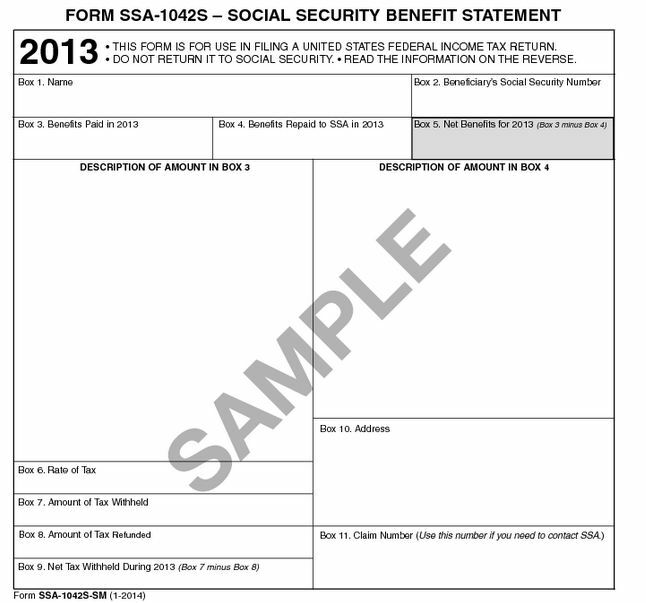 The IRS form used for withholding is SSA-1042S – Social Security Benefit Statement. For instance if a monthly Social Security retirement payment is US$2,000 (gross), the tax withholding of 25.5%. creates a total tax withholding of US$510 (25.5% x US$2,000). 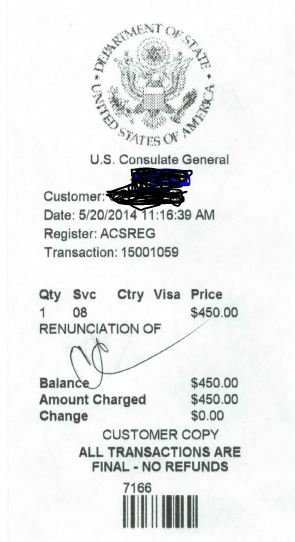 This leaves a net retirement payment of US$1,490 that will be received by the former U.S. citizen. In relative terms, this is a very high effective tax rate, i.e., 25.5%, particularly considering in this example the former USC has only US$24,000 of annual Social Security retirement payments. The same withholding tax rate applies if the former USC has millions of dollars of annual income, or no other sources of income; 25.5% – period. See, IRC Section 86 for the specific statutory rules which provide that 50% of the Social Security retirement income is subject to taxation if the individual has an “adjusted base amount” of US$25,000 or more ($32,000 in case of a joint return). Once the “adjusted base amount” exceeds US$34,000 or more, then 85% of the Social Security retirement income is subject to taxation ($44,000 in the case of a joint return). In the example used above of the US$24,000 of annual Social Security retirement payments, this income level will create no U.S. federal income taxation to a USC (not a former USC) if he or she has no other income. In contrast, the former USC will have had indirectly paid (via the tax withheld), a total annual federal income tax of US$6,120 on the same amount of Social Security retirement benefits; US$24,000. For the discussion of the IRS, explaining these rules, see Publication 915. This entry was posted in Social Security Tax Considerations. There are many misconceptions about how the U.S. federal tax law works in general; and specifically regarding the “expatriation tax” provisions. This resource – http://tax-expatriation.com/ – is specifically designed to try to bring clarity to these complex tax laws where there are many “tax myths” floating around in the internet. This website of general information is certainly not a substitute for personal legal and tax advice to your specific circumstances. See, Limitations that explains why general legal information is not the same as legal advice, that is, the concrete application of law to a specific case with unique and particular facts. In order to provide a public resource, this website tries to help clarify some of these myths. Incidentally, the internet is a great resource for information and at the same time – misi nformation, misleading information, self-help snake oil gibberish and the like. I am often times amused, in a disturbed way – if I realize how someone might be making an important life mistake because of the lack the information and knowledge a person demonstrates they have in this area of the law, based upon their writings. As a wonderful example of this, see this WWW-website reference to medical self-diagnoses – which is ironic in so many different ways. It is written by “Dr. John Anderson” who is apparently not a medical doctor at all, but rather has a PhD in fisheries. It is common to see lay persons (or even purported tax advisers) reading and interpreting the law in a way they wish it were; the way they see it most favorable to their own circumstances, etc. These internet interpretations are usually not well founded in the law, especially not a comprehensive reading of the law, and especially in light of how the IRS and U.S. Treasury interpret the law. These comments are often a regurgitation of something someone has read on the internet or heard from a friend or acquaintance or a particular website. They often are full of “legal arguments” that at times smack of what U.S. courts have consistently found to be deemed “tax protestor” arguments which consistently lose in U.S. courts. Another post will be forthcoming explaining this important concept, as I expect we will see similar expatriation cases work their way through IRS tax audits, administrative tax appeals and eventually some will reach the U.S. courts surrounding the “expatriation tax” provisions. The world wide web is a powerful tool, when used prudently. Enough of my musings about how myths of U.S. “expatriation tax law” are compounded throughout the world with the WWW! If the law is not clear in its application, I will say it is unclear. If the law has been interpreted specifically by a particular Court, I will provide a discussion of that opinion. The “expatriation tax law” is an area of the tax law which has NO case law to date. There is not a single case that has been litigated by a taxpayer or the government surrounding Section 877 or any of the companion provisions. There are also no regulations to date; that have been issued by the Treasury; only a few notices. See, Does IRS Notice 2009-85 regarding expatriation have the “force of law”? Also, see, Why “covered expat” (“covered expatriate”) status matters, even if you have no assets! The “Forever Taint”! When is the loss of US nationality effective? However, the loss of US citizenship does not affect previously acquired derivative US citizenship or other immigration benefits for your children unless the DOS determines that the expatriation date preceded the children’s birth. So if you lose your US citizenship because you have renounced or relinquished your US citizenship and the DOS has made such a finding, you will need to obtain proper authorization to visit or work in the United States and will be subject to the US immigration laws, including the inadmissibility and removability grounds. As to the tax consequences of losing your US citizenship, you need to consult with a tax professional before making the decision to give up your US citizenship. Why “covered expat” (“covered expatriate”) status matters, even if you have no assets! The “Forever Taint”! The point of this post is to explain why “covered expatriate” status does matter, even for those with no assets. Most people in the world, probably think the tax expatriation provisions only are for the rich, wealthy and worldwide private jet owners. This is how the press (and members of Congress) typically portray those who renounce U.S. citizenship. The press articles typically cover the likes of Ms. Tina Turner and Mr. Eduardo Saverin, co-founder of Facebook. See,Tina Turner – Famous People Who Renounced U.S. Citizenship. Most articles focus on the “net worth test” (US$2M) and the “income tax liability test” (“US$125K+/-). See, Revisiting the consequences of becoming a “covered expatriate” for failing to comply with Section 877(a)(2)(C). Unfortunately, U.S. “expatriation tax law”, applies to the poorest former U.S. citizen (and certain long-term LPRs), wherever they reside if they do not comply with the certification requirements of Section 877(a)(2)(C). See, Accidental Americans” – Rush to Renounce U.S. Citizenship to Avoid the Ugly U.S. Tax Web” International Tax Journal, CCH Wolters Kluwer, Nov./Dec. 2012, Vol. 38 Issue 6, p45. So far so clear? But you are surely asking yourself, “this does not explain how this costs me any money or taxes, if I have no assets to begin with . . . “? If the certification requirements are not satisfied, the individual with no assets should have no U.S. income tax to pay as he or she will have no unrealized gains. If there are no “unrealized gains”, there can be no tax base and hence no income tax caused by the “mark to market regime”. However, there are two points of potential taxation under the law. First, when the USC or LPR leaves the U.S. (“expatriates”); which does not cause taxation in this example for the individual without “unrealized gains.” However, there is second point of taxation, under the law, which arises when a U.S. person receives a covered gift or bequest. IRC Section 2801. This might not happen until decades into the future, long after the expatriation event. Incidentally, someone could have significant assets, without any unrealized gains. Both individuals (the rich and the poor) would be in the same position as they leave/expatriate from the U.S.; i.e., and have no U.S. income tax to pay. For instance, USC “A” with US$5,000 in total assets, would have the same income tax to pay ($0) as USC “B” with US$15M of cash in the bank; assuming no other assets. Neither would have unrealized gains upon which to cause any U.S. tax. This is because US dollars/”cash” have a tax basis – the same as the currency amount. Hence, there is no unrealized gains in US dollars-cash. However, if in this case, assume both individuals (USC “A” and USC “B”) cannot satisfy the certification requirements of Section 877(a)(2)(C), and hence both would be “covered expatriates.” So what does that mean to them during their lifetimes (what U.S. tax might they have to pay)? The potential U.S. tax created to both USC “A” and USC “B” in this circumstance, is IF AND WHEN, they were ever to make a future gift or bequest (directly or indirectly – e.g., through trust) to a U.S. person. At that point in time, the U.S. beneficiary will have to pay effectively a 40% tax on the fair market value of the property received. This tax is created under Internal Revenue Code Section 2801, that was passed in 2008. See, The “Hidden Tax” of Expatriation – Section 2801 and its “Forever Taint.” A common example is a child or sibling who is a dual national, who might inherit assets in the future. The 40% tax is a lot of tax to pay – as there are virtually no deductions or exemptions from the amount of tax paid. I have proposed a series of recommendations to the Treasury regarding concepts and provisions that hopefully will be incorporated into their propose regulation project under Section 2801. More to come on this important topic. You may have family and friends who will become U.S. residents, even if none of them are today. Assume USC “A” renounces citizenship and in 40 years leaves a bequest to a daughter of US$120,000; the daughter has moved to the U.S. In this case, the U.S. tax law would impose more than a US$40,000 tax on the daughter when she receives the inheritance. This is a very high tax burden to pay, on what is a relatively modest inheritance. This is one, of multiple scenarios of why “covered expatriate” status can be so important – over the long run. In my practice, over the years, I have seen numerous cases where one single family member moves to the U.S. temporarily for work or study, e.g., graduate school, gets married and decides to stay on and live in the U.S., even for a while. Often times, they will have children, who will be U.S. citizens by birth in the U.S. Hence, a U.S. person is now part of the family tree. This entry was posted in Certification Requirement of Section 877(a)(2)(C). 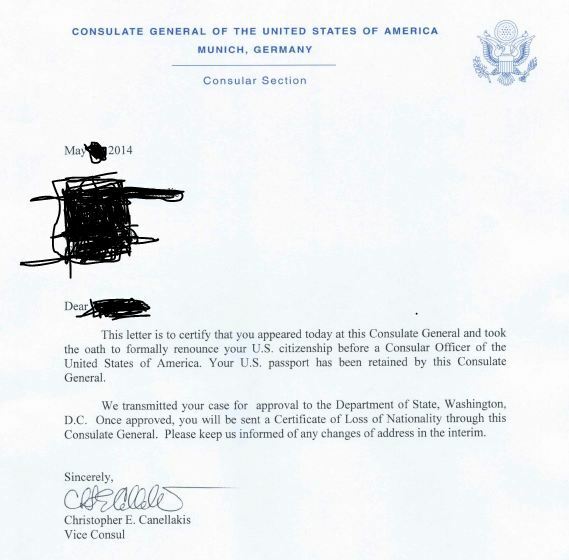 Who makes the loss of US nationality determination? 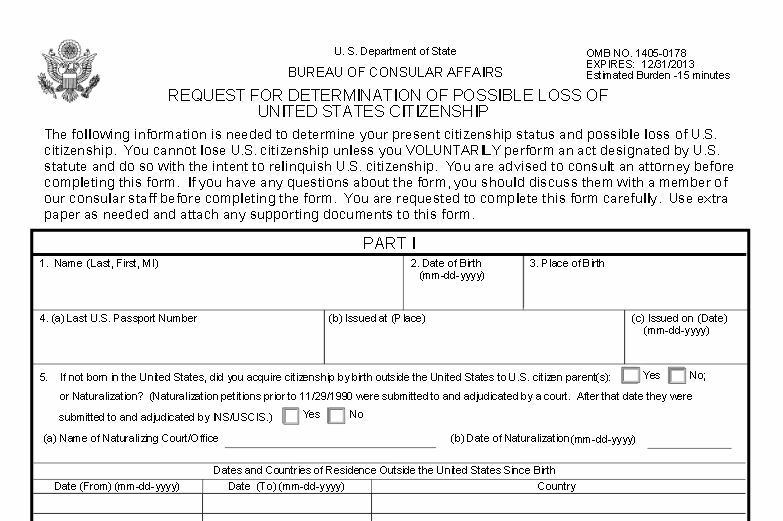 A US diplomatic or consular officer is authorized to certify the facts on which you may have lost citizenship by completing a Certificate of Loss of Nationality (“CLN”), and some other forms. The CLN must then be approved by a division Chief in the Office of American Citizen Services and Crisis Management (CA/OCS/ACS) in the Directorate of Overseas Citizens Services, Bureau of Consular Affairs of the DOS, or the Acting Division Chief. If you have a change of heart after appearing at the US Consulate and signing an Oath of Renunciation or the other related DS forms but before the CLN is approved, the Consular officer will notify the DOS and ask them to deem the request for loss of US Nationality withdrawn. If the CLN has already been approved, you will have to seek administrative review of the loss of nationality finding through the DOS Office of Legal Affairs, Bureau of Consular Affairs. When the DOS issues the CLN, it will cancel your US passport or naturalization certificate. Why vested Social Security Retirement Benefits are not lost when a USC or LPR sheds their citizenship or immigration status. The Answer to: What happens to social security benefits to former USCs and LPRS including a “covered expatriate”? While USCs have broad, largely unfettered rights to social security (including when they reside exclusively outside the United States), former USCs and LPRs fall into a different category, specifically including the tax treatment of those benefits. Also, the U.S. Congress has imposed limitations, first under the so-called Illegal Immigration Reform and Immigrant Responsibility Act of 1996 and later by the Social Security Protection Act of 2004. For the “Accidental American” who has spent virtually all of their lives outside the U.S. (and has never been employed by a U.S. employer), this discussion will largely be irrelevant to you as you will probably have no rights to Social Security Retirement Benefits. employed outside the United States by a U.S. employer. For a detailed discussion of how and when these federal employment taxes apply (including at what rates), please see “Comparative Overview of U.S. and Mexican Federal Employment Taxes,” CCH International Tax Journal, November–December 2009. Current Social Security Tax Rates, and the taxable base – contribution base (which adjusts annually) can be reviewed on the Social Security Website. The 1996 and 2004 statutory amendments reflected above, do not modify the rights of former USCs or LPRs. They do affect the rights of individuals who were not USCs or LPRs; namely who did not have legal immigration status while working and living in the U.S.
For a detailed discussion of this part of the law, please see the Congressional Research Report of 2010 titled Social Security Benefits for Noncitizens. The final conclusion about whether the Social Security Act restricts social security retirement benefits to “covered expatriates”, can NOT be expressly found in the statute or the regulations themselves. There is no affirmative answer in Title 42 or the regulations thereunder, regarding “covered expatriates.” It is silent on the issue and not expressly addressed. Most importantly, throughout the Social Security Act and regulations thereunder, because of the “silence” of the statute, there are no restrictions expressly imposed on “covered expatriates” or any other former USCs or LPRs. This category of persons, “covered expatriates” is not somehow identified or segregated in the law for disparate treatment. The law provides generally that Social Security Retirement Benefits are available to non-citizens and those who no longer have LPR status; provided they meet the previous work and eligibility requirements. Shedding USC or LPR does not strip these individuals of these benefits. 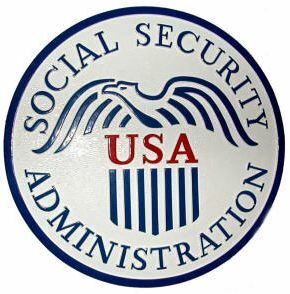 While it is always hard (impossible) to “prove a negative”; our office has also received telephonic confirmation from technical support personnel of the Social Security Administration, that the above conclusion is a correct interpretation of the law. Stay tuned to another post about how the U.S. imposes income and withholding taxes on Social Security benefits to “covered expatriates”; which is indeed different than for current USCs (and some LPRs) residing overseas. This entry was posted in Collateral Consequences - Non-Tax. Yul Brynner was born as Yuliy Borisovich Briner in 1920 in Russia. He won an Academy Award for best actor and two Tony Awards for the King and I. He also played the Egyptian king Ramses II in The Ten Commandments. He started the process for naturalization of U.S. citizenship in 1943 according to the document, Declaration of Intention, filed with the U.S. federal district court in the Southern District of New York. as his last place of foreign residency; which is a major port city located in China in the Liaodong peninsula. Apparently, Dairem is popular with Russian tourists. He was Russian. This is particularly interesting, since Yul Brynner was Russian and apparently moved to what was then known as “South Manchuria”? He renounced citizenship in 1965 in Bern, Switzerland, apparently for tax reasons according to a biography about his life. The highest U.S. federal income tax rate in 1965 was 70% (compared to today’s 39.6% rate). See, Personal Exemptions and Individual Income Tax Rates, 1913-2002. The income tax rate was substantially higher then, compared with the current rate, although it is a bit like comparing “apples” and “oranges”; since the tax deductions, exemptions and credits that existed in 1965, look little like the current law. This entry was posted in Famous People. Generally, a worker must have 40 quarters (which is 10 years) of “covered employment” to be eligible for Social Security retirement benefits. U.S. citizens have virtually no limitations imposed upon them for receiving retirement benefits, provided they have met the 40 quarters of “covered employment”. the employment must generally be full time. Historically, there were no limits on Social Security payments to non-U.S. citizens. Congress then passed a law in 1956 that required non-citizens to generally reside in the U.S. to receive Social Security payments. Notwithstanding any other provision of law, no monthly benefit under [Title II of the Social Security Act] shall be payable to any alien in the United States for any month during which such alien is not lawfully present in the United States as determined by the Attorney General. More details on social security retirement benefits regarding former USCs and former LPRs to come in a further post; specifically including a discussion of how the vested retirement benefits under the Social Security Act are not terminated upon a change of immigration status or loss of U.S. citizenship. See also, What happens to social security benefits to former USCs and LPRS including a “covered expatriate”?